Big deals on drop-tops | What Car? The sun's out, summer's just around the corner, so what better time to grab a deal on a desirable drop-top? We've hunted down the best discounts on some classy convertibles, but you'll have to move quickly to beat the summer rush. 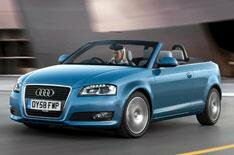 Few open-tops drop - or raise - their roof as quickly as the Audi A3 Cabriolet. Move fast and you'll pay just 21,969 for a 2.0 TDI S line model. That's a 3991 discount available at drivethedeal.com. BMW's 3 Series Convertible is beautifully built and great to drive and right now you can save yourself 3034 on a 320i SE at Motorlogix.com. The Mercedes-Benz CLK Cabriolet will be replaced soon, but that just means you can find cracking deals on the current model now. How about 30,768 for a 280 Elegance? That's a 6361 saving at drivethedeal.com. Volvo's C70 has a neat folding metal roof and the 2.5 T5 Sport Premium has oodles of kit and power. Save 2998 on one at Autobytel.co.uk. You can find more deals just like these in our new cars for sale section.